Hold on to your hats ladies and gents, this book is a wild dystopian ride unlike anything your going to find in the genre! It's like a western (with southern hicks thrown in), mixed with high fantasy, mixed with...Gladiators? Blood Red Road was so out there that I didn't even know how to classify it at first but it is without question a Dystopian and it's one you won't want to miss! I picked it up because my friend Steph at work recommended it, and by now, I know that anything she gives the nod is something not to miss. She's the reason I read Delirium and The City of Ember and they were both absolutely fantastic. 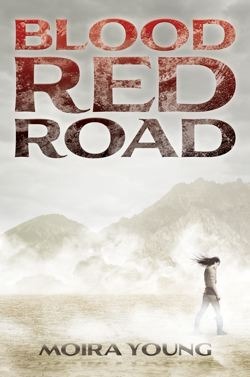 Anywho, Blood Red Road really hits the mark and has all sorts of twists and turns that make it a fabulous book, and one that must be part of a series because you just NEED to read more about the world where it takes place. Saba was a very interesting main character. She had a lot of flaws that had me keeping her at an arms length at first, but then she grew as a person and really became someone I'd like to spend some time with. The things that kind of put me off were things like how she treated her little sister Emmi. I can understand that she blamed Emmi for her mothers death, but the harsh and completely unfeeling way that she talked to Emmi was really painful to hear. Especially when Emmi would jump at the chance to spend time with Saba or do something to prove herself useful. Also...I have a twin brother, so I can appreciate the love that Saba has for her twin Lugh...but at times her obsession with him toed the line and was a bit too "Flowers in the Attic" for my tastes lol. (For those of you who don't understand the reference...read Flowers in the Attic by V.C.Andrews...its an epic book, but it might give you the heeby jeebys and make your skin crawl). The way Saba spoke about spending time with Lough was the way I've seen a lot of MC's talk about their potential love interests so it was kind of disturbing to see it when talking about her brother. The writing style was very unique. For one thing, there was no quotation marks to indicate dialogue. You just kind of had to go with the flow and interpret who was talking by their dialect and their mannerisms. It took a little bit of time for me to adjust to this kind of writing, and dealing with the dialect was difficult at first. However, didn't take long for me to jump on the country bumpkin bandwagon and "git along fer sure" right along with Saba. I feel like the dialogue really lets you get sucked into the book and experience the time period it takes place in. The Wreckers (Apparently our current civilization) left behind nothing but metal shells and wastelands, and its easy to see how easily we can lose our cultured language and fall into slang and really vulgar dialects. I feel like some people will struggle with the way Saba talks, but for me, it really helped shape her character and add to the dystopian feel of the novel. The plot you ask? FREAKING AWESOME! There were so many different aspects that I can't even begin to cover them all. Let's go with the gladiator components. These were some of my favorite scenes of the entire novel. Saba is enslaved as a cage-fighter and in this world, if you lose three times you're out...literally. The crowd of cheering fans will rip you limb to limb as you try to run out of the stadium...How awesome is that! lol...sorry...I guess I have a kind of sick and bloody mind. Anywhoo...Saba never loses a match so she becomes known as the Angel of Death, delivering all the other women she has to fight against to the bloodthirsty crowds. I loved Saba's description of an angry red cloud that just takes her over and allows her to fight. She describes it as fury at Lugh being taken, worry for what is happening to Emmi, and all sorts of other dark emotions, and it was fun to see her channel all of her anger, pain, and fury into completely annihilating her competition. She really stands out for her strength and cunning, both by lasting so long in the cages and by her plans to escape. I give Blood Red Road 4.5 Keys!! It was an amazing book, and one of the best Dystopians I have read in a good long time. The only reason I'm not giving it 5 Keys is because I struggled with the Saba's love interest and her weird way of thinking about love. I'm a Romantic, and when a character shows more Lovey feelings for her brother than the guy she's supposed to be falling for, I can't help but get a little creeped out. Also, I thought the king wasn't developed enough for my liking, and I want to learn more about the different aspects of this new world. I can't wait to read book two...fortunately it should be coming out soonish so Yay! More Saba, Emmi, Nero, and the gang! I didn't expect Blood Red Road to be one of my favorite dystopias when I read it earlier this year, but it turned out to be one of my favorite reads this year. I also couldn't really connect with the romance - it felt too forced, just thrown in there because it was expected. Not sure this one would be right for me, but I will look it up and read a bit more about it. I hadn't heard about this one before. Great review. I've been wanting ot read this book so badly, but haven't gotten the chance to yet. Hopefully in 2012! I hope you had an awesome new years. Happy 2012! I read the sample of this book and now I can't wait to get my hands on it. I'm not normally into Dystopian books, but this one sounds really amazing. Thanks for the review!